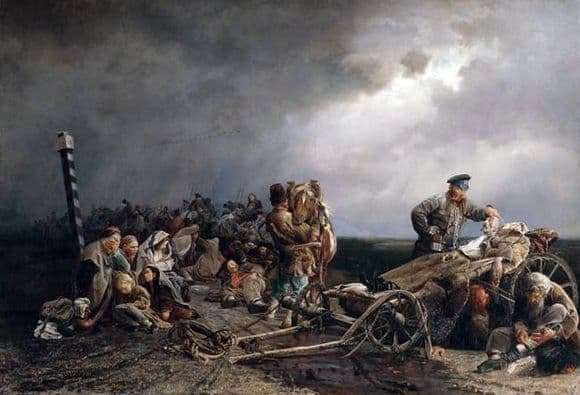 In 1861, one of the greatest Russian masterpieces of the time saw the light of the day – Valery Yakobi’s painting “Halt of Prisoners” The product is frank, sharp and topical. Such a blatant expression of one’s own thoughts is characteristic of the 60s of the 19th century. Actual problems of society, like sores, are opened by the artist on canvas. The choice of plot is not accidental. Valery Ivanovich spent his childhood and youth in the eastern regions of Russia, where he observed the hard life of prisoners with his own eyes. Unhappy drove past the house where the artist lived. The memories are so firmly embedded in his head that the picture recreated from memory is striking in its realism and strength. One of the central images of the work is the dead man on the cart. He is dressed intelligently. His image betrays an educated person who has been punished for his judgments about the state system and political activity. On his hand can be seen the ring, which shoots another convict, he was lucky to survive. Even in such a situation, the negative human essence is manifested. In the left corner of the picture depicts a family of prisoners. Women and children who chose this path of their own accord are exhausted and weakened. The great fortitude forced them to go after their men on a long journey, from which not everyone was destined to return. They mourn the dead and sympathize with the living. In contrast to their emotions is the prisoner smoking a pipe nearby. It seems that he no longer has the strength to worry about his fate. The landscape is made in dark colors. Pre-storm sky is about to burst under the onslaught of autumn rain. The steppe is gray and bleak. The impression from looking at a masterpiece of dark, heavy, leaden. The picture remained the best work of the author, the level of which Jacobi could no longer surpass.